Flames shoot through the roof of a two-story house in the 700 block of Grand Avenue in Glendora Sunday, May 10, 2015. 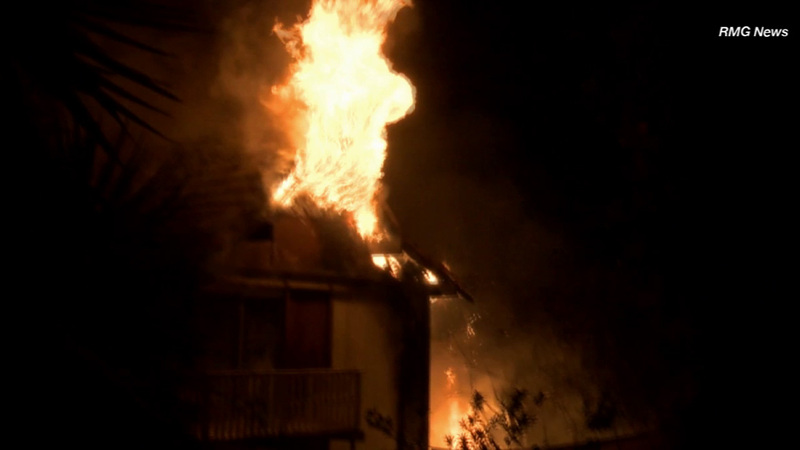 GLENDORA, Calif. (KABC) -- Hoarding conditions may have fueled a stubborn house fire, which smoldered for hours, in Glendora early Sunday morning. The blaze erupted at a two-story home in the 700 block of Grand Avenue at about 1 a.m. Responding firefighters found flames shooting through the roof. Firefighters say the pack-rat conditions made it tough to get the fire under control, but it was eventually knocked down around 4:30 a.m.
No one was home at the time. No injuries were reported. The cause of the fire remains under investigation.